Last night I drove down to the Barnes & Noble in Mira Mesa (San Diego) to meet the lovely Jen Lancaster! Jen Lancaster Reading from her new book. I arrived at 4:30 and got in line to get my numbered wristband, which would dictate my place in line during the signing. I started reading the book while waiting and after I chuckled (I believe after reading the first ORNESTEGA incident) a group of ladies behind me started talking to me. After we got our wristbands I wandered around the store for a bit before realizing I had two hours to kill until the event, so I left the store. I spied an On The Border, so I decided to stop in for a margarita and some grub while I waited. Lo and behold, I walk into the bar and the ladies from the line are there! They invited me to join them for margaritas and we had a lovely couple hours chatting. Finally we went back to the store to start the Reading/Q&A/Book Signing Session. 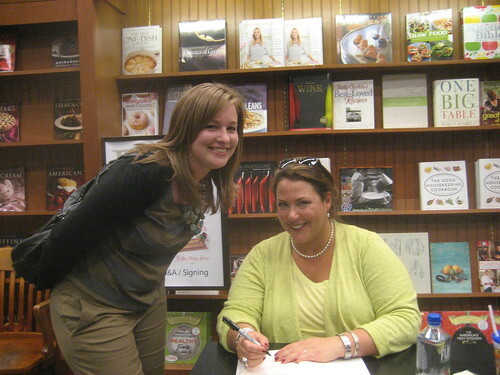 Jen was as awesome and funny in real life as she is in her books and on her blog & twitter. I had an awesome time! I had a great time! 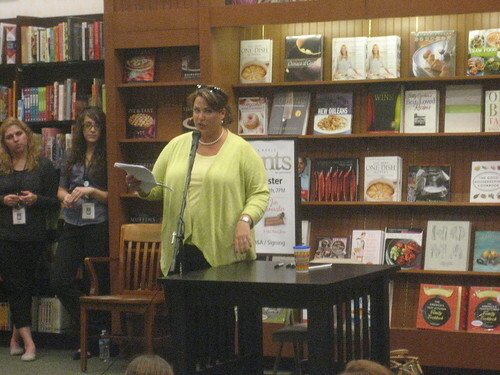 I hope Jen comes back to San Diego on her next book tour (and brings Fletch with her next time)!